I illustarted this map for Duncan Campbell's article in Ancient Warfare magazine. Vol.1. Issue 4. It depicts the Roman siege works of Numantia (135-133 BC) during their campaign to conquer what is now Spain. Duncan is great to work with, because he always provides a detailed pencil sketch with other published maps of the area for reference. I just dress it up with paint and text. 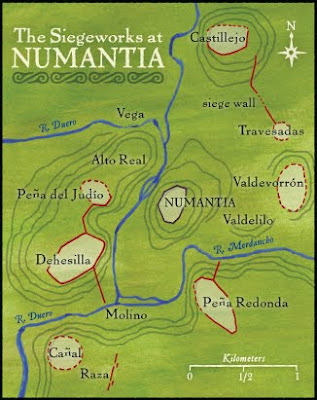 The decorative motif appearing below the map title is based on an Iberian shield design. Osprey's Rome's Enemies (4) : Spanish Armies 218-19 BC has a photograph of a ceramic figurine carrying a shield with this design. Speaking of Duncan Campbell and Osprey, he has authored a number of ancient siege books for that publisher. Thank you! I'll show it to my students, they'll get a far more vivid idea of Scipio's strategy for the siege.